According to American market research, analysis and advisory firm, IDC, while we can expect to see wearable device shipment volumes reach around the 19 million units mark this year, that figure will grow considerably to about 112 million in just four years. We can also expect to see the number of connected devices increase as the Internet of Things (IoT) delivers more devices, some of which fall in the wearables category. Wearable technology has become a hot market in the tech industry. Companies like Nike, Samsung, Fitbit, Jawbone and a few others, are already offering different wearable devices. This year we have not only seen new devices from these companies, but we have also seen Apple and Microsoft introduce wearable devices for your wrist. Ingenic Semiconductor is a fabless semiconductor company, founded in 2005 and based in Beijing, China. They purchased licenses for the MIPS architecture instruction sets in 2009 and design CPU-microarchitectures based on them. They also design system-on-a-chip products, which include their CPUs and licensed semiconductor intellectual property blocks from third parties. On November 12, 2014, the company announced that they wanted to help enthusiasts make and test their own wearable devices. They accomplished this by introducing the Newton2. This is a small circuit board that includes processors, sensors, wireless and graphics capabilities all of which are needed for wearables. As you can see from the images below, the board is quite small measuring only 15 millimeters by 30 millimeters in size. According to Ingenic’s description, the Newton2 has achieved a 50 percent reduction in area from the original model, which was only shipped this past June. 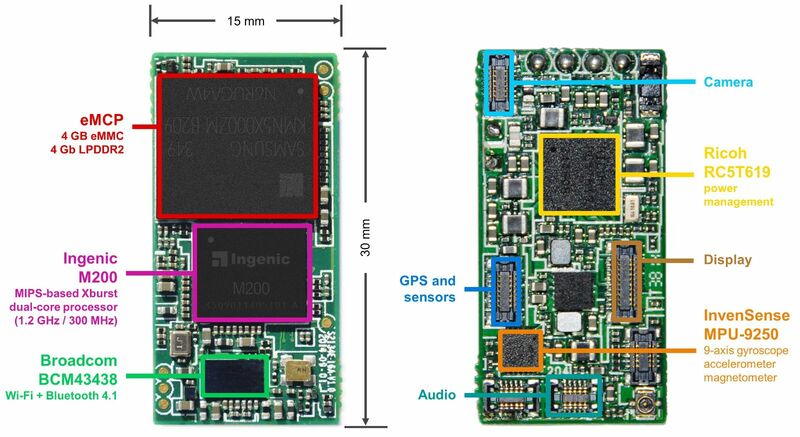 The newest version integrates the main application processor, a smart power management controller, eMCP memory, on-board Wi-Fi and Bluetooth connectivity and a MEMS sensor, together with seven dedicated connectors for the usual interfaces, such as display, audio and camera. In addition, battery life has also been improved significantly with standby power consumption for Newton2 now being less than 3mW. This allows devices to work for twice as long. The Newton2 features the Ingenic M200. This is a brand new chipset that implements an innovative architecture designed from the ground-up for the low power and reduced area requirements of wearables. 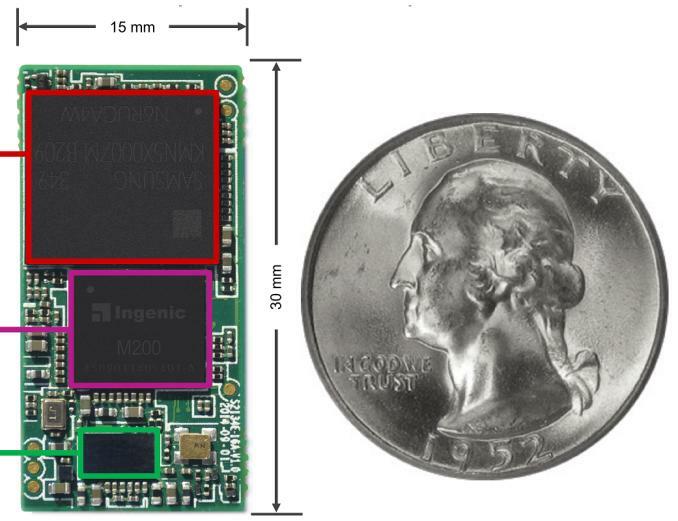 The M200 implements a power-saving hardware architecture where a high-performance MIPS CPU clocked at 1.2 GHz is designed to take on most of what can be considered the heavy lifting, while less demanding tasks are handled by a secondary low-power 300 MHz MIPS CPU. The Newton2 is looked at as a development kit. This is something that is becoming quite popular among devotees who develop and test devices before they are released. Unlike its competitors, Ingenic positions the Newton and Newton2 platforms not as reference designs but rather as complete solutions. While Ingenic could simply sell you the entire module as-is in high volume, if purchased in bulk, it will build customized versions. At this time there is no pricing information available.